Use newspaper for cleaning glass. Ditch the paper towels and use newspaper to clean glass and mirrors. Coffee filters are also a good paper towel alternative. You’ll have less lint. Clean baseboards with dryer sheets. They get rid of static and fight dust. Clean with vinegar. A mix of equal parts vinegar and water makes an effective all-purpose cleaner, plus it disinfects and deodorizes. Use it to clean counter tops, around the bathroom, and the kitchen floor. The vinegar smell goes away when it dries. Make a carpet powder with borax and baking soda. Combine half a cup of each and stir in 20-25 drops of your favorite essential oil. Sprinkle it on your carpet and wait 15 minutes before vacuuming. Clean the insides of vases with rice. Vases and decorative bottles can be beautiful but those with narrow necks can be hard to clean. Put a few tablespoons of dry rice in the vase or bottle, then fill it three-quarters full with warm water. Put your hand over the opening, shake the vase or bottle, then rinse. Freshen with lemon. Give your garbage disposal a clean, fresh scent by putting some small cut up pieces of lemon rinds in the disposal. 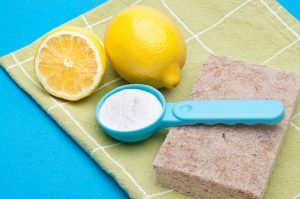 These cleaning supplies are not only inexpensive, but most are also eco-friendly. They are good for your wallet, and good for the environment!